After breaking down in Yosemite National Park and effectively losing a day of exploring to logistics, we spent the following few days exploring as much as we could of the park. There were still parts of the park we couldn’t get to as they were closed off by snow (in mid-March!). In fact, the only part of Yosemite National Park we could see was The Valley. Nevertheless we saw a lot and had a great time exploring Yosemite. 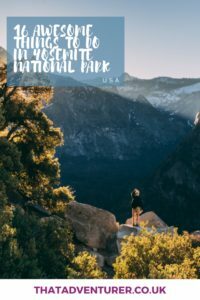 Here are some of the best things to do in Yosemite National Park (including a few we didn’t get to do this time round because of the weather!). Yosemite National Park is actually a place people call home all year round. 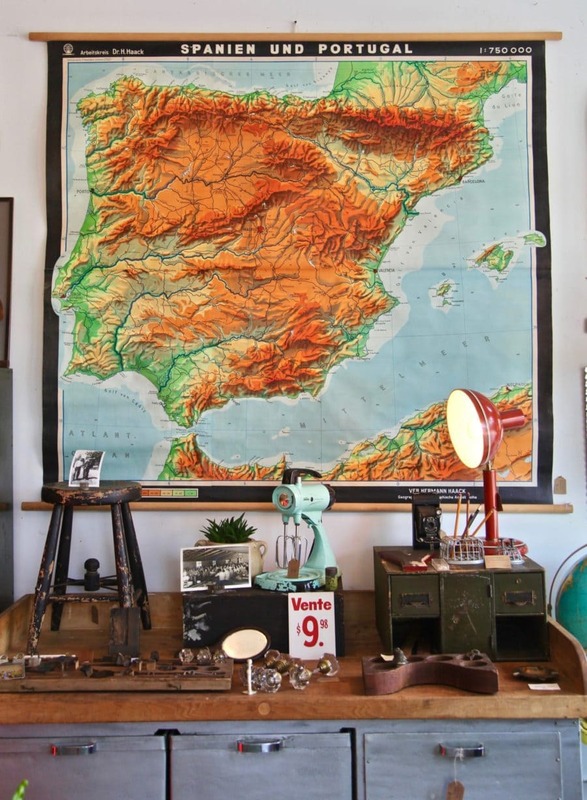 There are shops, garages a library (Top tip: free internet here! ), pubs, museums and more. It’s worth taking a stroll after a long hike or during your morning coffee run. After hiking Yosemite Falls and grabbing a shower at the campground in Curry Village, we grabbed a local beer and some crisps from the shop there (tip: cheaper to get a single from the shop than the bar or restaurant!) and sat on the deck with other hikers. Despite the fact that I kept falling asleep while we headed back to the park, the moment that I was awake were pretty special. The park is much emptier at night (as you’d expect) but that means you can find places to park up near some of the best sites, such as El Capitan. 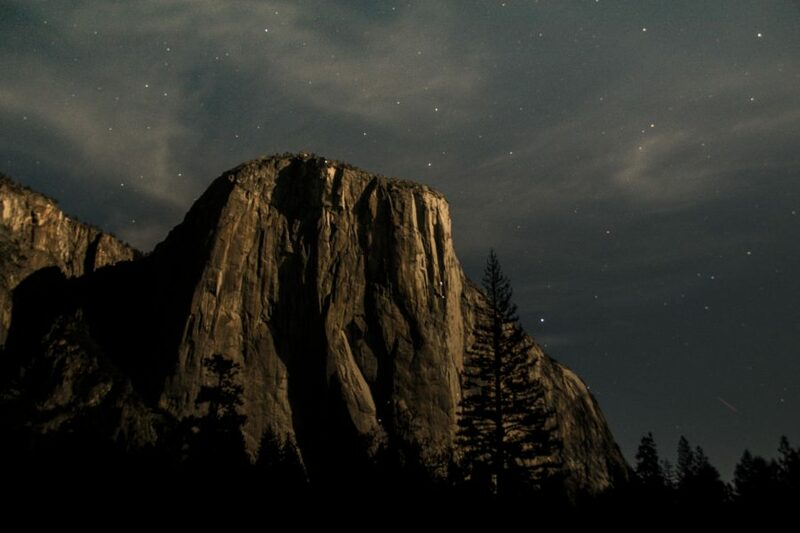 The full moon lit up the valley floor and gave Yosemite National Park a whole new light. We gazed up at El Capitan and watched the lights from the climbers move about on the rock face as the climbers chatted and tried to get some sleep (God knows how!). This was an area of Yosemite National Park that was closed off due to there still being too much snow. However, if you visit when it’s open then you’ll be treated to some incredible views. 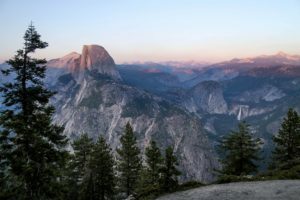 This moderate hike of Taft Point and Sentinel Dome is found along the Glacier Point Road which runs above the Yosemite valley. It takes about two hours so is great as a morning or afternoon hike. 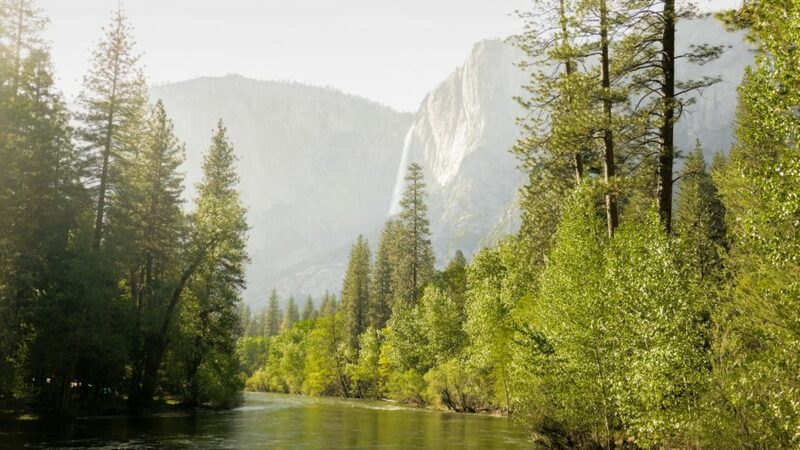 Tunnel View offers one of the most famous views of Yosemite Valley. From here you can see El Capitan and Bridalveil Fall. There’s also Half Dome peaking out in the background. If the snow hasn’t blocked the road for you, like it did us, then make sure you head here! Bridalveil Falls was the first part of the park we saw. As I mentioned above all the waterfalls were in full flow and Bridalveil was in such full flow that it had actually flooded most of the car park! If you’re a seasoned hiker and fancy taking on El Capitan then go for it. However, I will most certainly not be joining you. 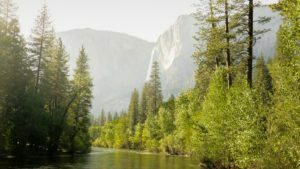 Another great thing to do in Yosemite National Park is to hike through Tuolumne Meadows. Yes, this was also closed to us in mid-March but there’s plenty of hiking to do here when it is open with some beautiful views. Whilst I would love to take on the challenge of scaling Half Dome it’s a pretty hard feat to accomplish. 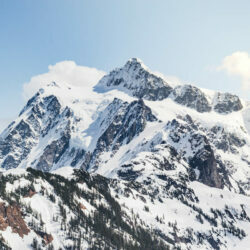 Not only is the hike hard, but getting a permit to do the hike in the first place can be tricky. On top of that the trial was closed while we were in Yosemite, so no Half Dome for us! The Mist Trail is one of the best known hikes in Yosemite National Park. 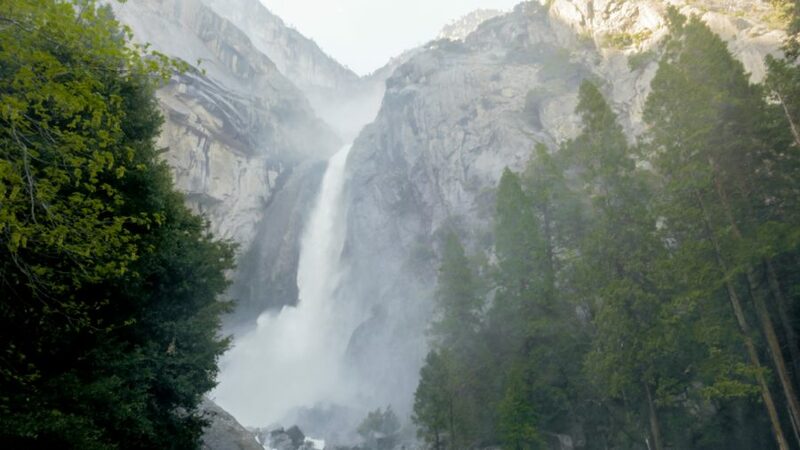 Many people hike it to gaze at this Vernal Fall and then add a few more miles over to Nevada Fall. 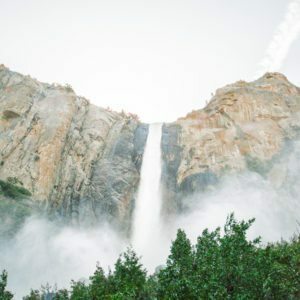 Nevada Fall is the closest waterfall to the Sierra Nevada mountain range and this 7 mile return hike gives you great views of the Muir Trail too. Located about an hour from the valley floor, stop here to get a less common view of Half Dome and Yosemite Valley. 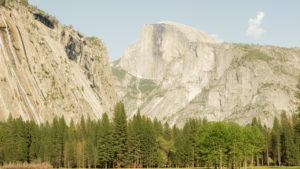 You’ll even be able to see the people climbing the cables of Half Dome! I’d definitely recommend walking through the valley between these different villages. It’s all flat and there are some gorgeous houses, meadows, forest and streams to cross over. Plus, you’ll get a great view of Half Dome and the mesa top. Whilst Yosemite has many lakes, a lot of people say that this is the most beautiful lake in the park. It’s tucked between granite peaks and domes and you can kayak, swim, or even ice skate (in the winter) on Tenaya Lake. 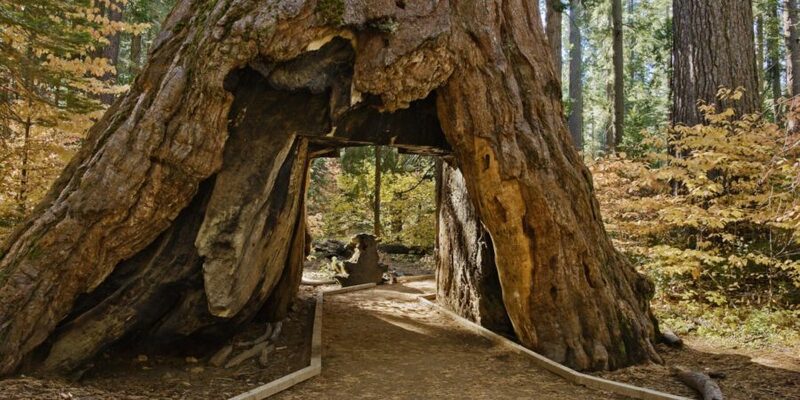 If you’re not heading to Sequoia National Park or to the Redwoods then get your tall tree fix at Mariposa Grove! On our first full day in Yosemite National Park we climbed to the top of Yosemite Falls. 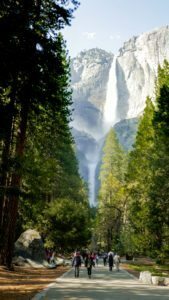 The hike to the top of Yosemite Falls is a 7.2 mile round hike which is pretty steep in places as it rises 739m above the valley floor. Once at the top the view of the valley floor and the other recognisable landmarks around the park is incredible. Take a little walk down towards the cliff face and you’ll find a few spot that allow you to get super close the the water fall as it crashes over the cliff face and down below. This was made all the better by the fact that the waterfalls throughout the park were in full flow. All that snow which had lead to us having to making a long detour was just starting to melt and the result was super powerful waterfalls! The famous artist, Ansel Adams, took some of his most famous photos here. From Cooks Meadow you’ll be able to see Cathedral Rocks, Three Brothers, and Half Dome. So pretty! Thanks for the tips. 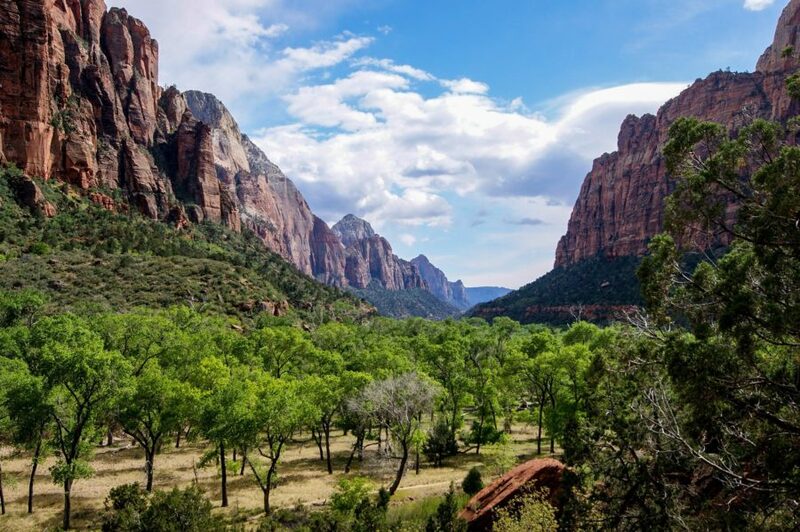 It’s on the top of bucket list of parks to visit in the next year or so. It’s so beautiful is’t it!